There’s just something about bangin’ K-pop dance covers that make you wanna get up and groove! Need a little motivation? Slip on your dancing shoes and get ready to be amazed by these 8 K-pop dance covers. If you need proof to see how far K-pop dance covers have spanned across the globe, look no further than K-City’s flashmob-inspired cover of K.A.R.D.’s ‘Don’t Recall’, right smack in the streets of Vancouver, Canada. Dressed in all-white ensembles and armed with confidence, the foursome busts out moves to the intrigue of bystanders and passersby. Are you entertaining the thought of throwing out some spontaneous moves at Orchard Road yet? A popular favourite among K-pop dance cover crews is this bubbly bop from BLACKPINK. But while usually a staple for female-centric crews to take on, leave it to the all-male troupe from EAST2WEST to do the choreography justice in their own right. Hip sways, sashays and sass – checked! Gather your squad and put your skills to the test rivalling this impeccable cover of NCT 127’s simmering hip-hop track. Dripping in swag, the dance moves will have you sweeping smoothly from side to side, all whilst cooperating with your bevy of fellow dance floor killers to pull off coordination at its finest. Can anyone say boomz? They say imitation is the best form of flattery, and there ain’t no better way to emulate the appeal of Red Velvet’s latest smash than taking a cue from these VIVA DANCE STUDIO girls. Clad in similarly red-accented outfits as in the original video, this fierce fivesome channel some serious #girlpower vibes throughout, nailing the dance to a tee. We ‘Really Really’ can’t take out eyes off this cover! Def Dance Skool’s crew of fierce female dancers prove they’ve got the sizzle and skills similar to Winner. But instead of the grayscale-toned visuals of its original video, this dance cover pops with colourful outfits in front of a bright burst of graffiti art to inject a breath of fresh air in the routine. Forget dance studios or street alleyways when you can go big. RISIN’ CREW takes it up an ante by recruiting a full clan of supporting dancers in tow, even locking down a similar-looking location as the original MV for an accurate representation. Wind-swept hair, picturesque backgrounds and poetry in motion – this is how you do dance covers right. One of the leading dance schools in Korea, 1MILLION Dance Studio prove their outstanding reputation is well-deserved with their array of explosive dance covers ranging from K-Pop hits to the latest international chart-burners. Just take their Rikimaru Chikada choreographed routine for iKON’s electro-hop hit below for example – showing how they kill it solo, in a trio, or as a fivesome. Truly #Lit! Who says you need a whole squad to do your thang? When you’re left alone to practice your skills, follow the lead of Lisa Rhee’s dance cover of the PRISTIN earworm ‘WEE WOO’, to make sure you don’t get left behind in the next rehearsals with your friends. Remember, part of slaying it together with your crew is having confidence individually and embracing your inner shine as well– time to break a sweat! Think you can best these videos and show us what you got with fellow dance enthusiasts? Sign up now for the upcoming Teenage Dance Challenge! We’re all familiar with their famous parents, but these celebrity kids have been dominating the social media sphere in their own right. Hit follow on these celebrity offsprings’ Instagram accounts and check out how they’ve been taking over their parent’s places in the spotlight. The only daughter of the late Michael Jackson and Debbie Rowe, Paris isn’t afraid to be an open book on Instagram. The 18-year-old frequently shares pictures of her travels all over the world, fun selfies with her friends and heartfelt throwback snaps of her father. The second child of the Beckham brood, the 14-year-old joined Instagram only recently, but has since racked up quite the following. Besides sharing sweet family moments with big brother Brooklyn and parents David and Victoria, the teen also shares snaps of his tennis sessions. Could he be the next Roger Federer in the making? You would probably have to do a double take when scrolling through the feed of Reese Witherspoon and Ryan Phillippe’s daughter, because the 17-year-old looks so much like her mum! While her account is mostly filled with artsy snaps, the teenager also occasionally shares pictures of her all-star mum and super cool dad. The youngest daughter of director Judd Apatow and actress Leslie Mann, Iris is as talented as they come. The 14-year-old is currently starring in the Netflix original series Love, but her Instagram account mostly feature gorgeous selfies and playful photographs of her excursions with her friends. Being the daughter of Lionel Richie definitely has its perks, occasionally featuring other Hollywood celebrities in her photos. But the 18-year-old really captivates when she shares snaps from her modelling endeavors, not to mention her amazing travel photographs that has got us reeling from wanderlust. The gorgeous offspring of equally beautiful parents, Johnny Depp and French singer-songwriter Vanessa Paradis, the 17-year-old was certainly blessed with good looks from both sides of the family tree. The doe-eyed beauty is a constant fixture in the Chanel brand and blesses us mere mortals with pictures of Chanel’s creative director Karl Lagerfeld, among her beautiful magazine outtakes. Perhaps one of the tamer (by Hollywood’s standards) celebrity kids on the list, Meadow shares with fans her relatively down-to-earth lifestyle with photos of her and friends on fun outings. The 17-year-old beauty also shares throwback snaps that honor her late father and Fast & Furious star, Paul Walker. Genetically blessed with good looks and a spitting image of her supermodel mother, the gorgeous 15-year-old daughter of Cindy Crawford and Rande Gerber fills her feed with selfies and outtakes from her photoshoots as well as goofy snaps with friends and family members. Which other celebrity kids do you follow on Instagram? Why do you love their Instagram accounts? Sound off in the comments below! 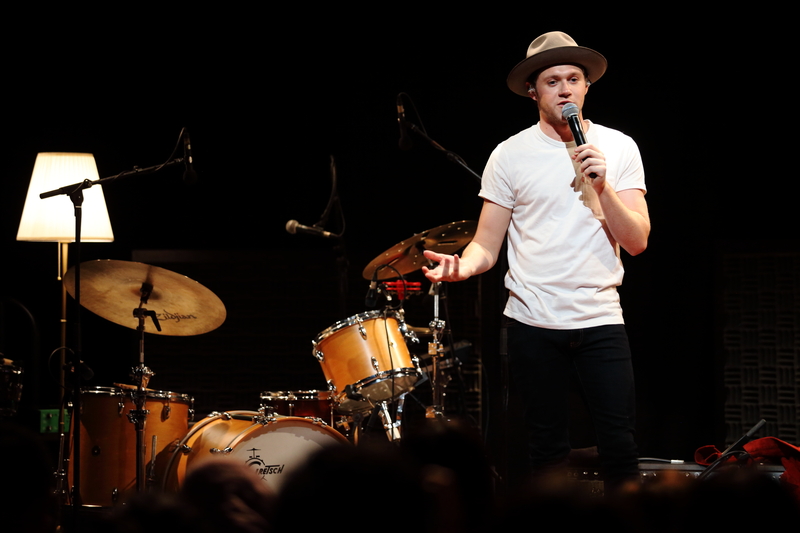 Niall Horan’s abrupt stop in ‘This Town’ last week for a highly exclusive, invite-only showcase definitely made the rounds on social media. After all, he’s the first member to stage a solo performance, even ahead of former band member Harry Styles’ concert later this year. Understandably, some Directioners were disappointed at not being able to catch him in action but fret not! We’re sure he’ll be back before long. Ahead, we take you behind the curtain and reveal the highlights of Niall’s super secret mini-gig! Although 4 songs are hardly enough for his fans (and us), Niall made up for it by allowing everyone present to ask him questions via a short Q&A session. Of course, this delighted the fans who were lucky enough to win passes to see him up close and personal, as he shared surprising anecdotes and even greeted fans who couldn’t be there, on FaceTime. And the audience had the privilege of learning one fact about his yet to be titled album: that he made a room full of adult men choke up after listening to a song he recorded. And what was that song, you ask? We have no clue. Niall wouldn’t divulge any more info on the track even after Rozz, the emcee for the night, prodded him about it, leaving us with a gigantic cliff hanger. He did however, share that we’ll hear more about this tearjerking song upon the album’s release (duh). You’d think that being a member of the biggest boy band in the world would draw the ladies left and right, but apparently not in Niall’s case. When quizzed if he has to try hard for female attention (or if it comes naturally to him), the star bashfully refuted the latter. “I think the Irish charm doesn’t get you as far as people think!” Niall quipped, much to the fans’ disagreement and delight. There still isn’t much concrete information about Niall’s much-anticipated solo album, but he did whet the audience’s appetite by revealing that his backpacking trip across Southeast Asia in early 2016 did help give him inspiration and time to come up with concept and songwriting ideas. Only time will tell what those might be! Great to see my good friend jer and his lovely band mates @thelumineers yesterday. Always a good laugh . If you’ve noticed Niall increasing penchant of sporting a beret, there’s a good reason for it. He cited the golf course, in addition to his home, as one of the go-to places he would be to unwind and “chill out” to detract him away from stress. So now you know just where to be if you’d want a glimpse of the charming crooner! Do you think Niall Horan’s solo album will prove his mettle as a solo artiste? Let us know your thoughts in the comments below! Not everyone can dance – and that’s a painful truth. But when the bass drops and the infectious hook comes on, it’s hard to deny that inherent desire to groove to the beat. Sometimes, you just want to feel the music course through your body. And bopping up and down like a lifebuoy just won’t cut it. So here are some cool (and relatively easy) dance moves you can pepper into your very own musical number. It’s like you’ve snapped your neck while bending over. But you power through, and you let people know that you’re okay. If you’ve ever felt like a pendulum, then this move is for you. Alternate your swinging arms to the front and the back, and you’ve got a winning move that’ll upstage even Katy Perry. Trust us – it has been proven. PSY know what’s good when it comes to delivering the next viral dance move. Pretend that you’re unbuckling your belt when you realise there’s more to the buffet spread than you expected. One should never say no to good food. Magikarp comes to mind when seeing Lorde prance aggressively with gusto. It feels like the move ‘splash’, but then again isn’t that just all of us when our #OTP actually ends up together? There’s something about this move that’s … really really cool. It’s like you’re paddling vigorously on your kayak, but you’ve brought your swag along for the ride. Where are you going? It don’t matter when you’re looking this hip. Try walking away in unison. Picture this: you and your friends are strutting off after slaying the last paper in the the examination hall. After all, the actual end of the EOYs calls for a celebration. This one is easy to visualise – you wear a bib, realise it doesn’t look cute on you. So you take it off and fling it away. Cause nothing should cram your style. Grab a friend, and reenact the scene when you realise that that door knock was the pizza delivery guy. It’s hard not to smile when you think of pizza at your doorstep. Delivering major JT vibes, Liam shows off his sleek moves and rhythmic new song. Pretend you’re fanning the air after sneakily releasing your fart. What’s that smell? Your air of coolness – that’s what. Think of this move as a celebratory dance for getting over your ex. Shake your arms in triumph, and flip your hair when you find out he’s dating someone less cute. Throw in a goodbye kiss for good measure. An oldie but a goodie, grab a few friends to complete Vixx’s ‘Chained Up’/’Ring Around The Rosie’ move. We imagine it’ll come in handy when zeroing in on that last free table at the hawker centre. Feeling the itch to bust some of these moves? The upcoming Teenage Dance Challenge is the perfect platform to showcase them killer moves. Get inspired by some of the above routines (we promise we won’t tell) or recreate your favourite choreographies. Either way, this challenge will be a great excuse to put on your dancing shoes. So round up your dance crew and signup today. Being able to sing and dance is part of the package of becoming an K-pop star, but when you can act on top of it all, consider us sold. With more and more idols taking the leap of faith into acting, we take a look at the recent crop of young triple-threats poised to become the next big things in K-drama land. It’s been a busy year for the former I.O.I sweetheart, lending her mellow vocals for The Legend of the Blue Seas OST, displaying her emceeing skills on Get It Beauty, etc. But fans will have more to look forward to come July, as Kim Se Jeong is set to make her K-drama debut on School 2017 alongside fellow idol peers SF9’s Rowoon and former SECRET member Sunhwa. Although the Gugudan member has made cameos in the past, we’ve yet to see much of her acting capabilities so here’s hoping her upcoming role will be a promising one! School 2017 premieres on 7 July. Like her I.O.I counterpart, Jung Chae Yeon has been fleshing out her acting portfolio since her Produce 101 fame, having flaunted her acting chops with a debut role in Drinking Solo as well as a leading stint in web drama 109 Strange Things. Making her small screen comeback in upcoming supernatural drama Reunited Worlds, the trending darling will be playing the younger version of the lead heroine (Lee Yeon Hee). And it doesn’t hurt that it stars an eye-candy male cast featuring Yeo Jin Goo and Ahn Jae Hyun – all the more reason to watch it! Reunited Worlds premieres on 19 July. Heartthrob alert! While we’ve seen the ASTRO hottie in web dramas To Be Continued and My Romantic Some Recipe, The Best Hit marks his first ever foray into the small screen – and there’s just something about his bad-boy character (who has an odd penchant for cringey dad jokes) that charms the socks off viewers. Fun fact: Cha Eun Woo plays the role of fictional Hallyu star MJ, which is actually another ASTRO member’s stage moniker! Bonus: Watch Cha Eun Woo and Kim Se Jeong being all romantic with each other on their recent CF together! If you didn’t know better, you’d have totally thought this was a K-drama – and hey, this is one pairing we can definitely get behind. The Best Hit is available on Viu. Singer, variety diva, fashion muse and now budding actor… is there anything Key can’t do? After a supporting stint alongside co-star Jung Chae Yeon in Drinking Solo, the talented idol lands another starring role in ongoing thriller drama The Guardians where he plays a genius hacker in a team of justice-fuelled vigilantes. Psst, the SHINee member also gets his very own love line with Kim Seul Gi’s character – bring on the LAN cable chemistry! The Guardians is available on Viu. While his Fantagio labelmate and fellow 5urprise member Seo Kang Joon has been dominating the scene, the 23-year-old is finally taking his turn in the spotlight with a solid repertoire of small and big screen works, including the much-anticipated remake of Bride of the Water God. Taking on the role of wind god Bi Ryum who harbours a one-sided crush on water goddess Moo Ra (Krystal Jung), we can’t wait to see how this unrequited romance will unfold! Bride of the Water God is available on Viu. Which idol-turned-actor are you looking forward to the most? Comment down below! More related stories: Song Joong Ki And Song Hye Kyo Reportedly Already Dating While Filming Descendants Of The Sun!, 8 Oppa-Approved Pickup Lines That Will Win Over Your K-Drama Obsessed Sweetheart, Who Would Win In A Cook-Off Between SHINee’s Onew And DIA’s Chaeyeon?